Watershed in Bristol has announced the seven shortlisted projects for its pioneering creative technology award. Bristol-based film and digital media centre Watershed has announced the shortlist for the third international Playable City Award. The award challenges artists and creatives to propose new and distinctive ideas for a future-facing artwork that puts people and play at the heart of the city. Alongside a £30,000 prize fund and support from Watershed’s Pervasive Media Studio to develop their idea, this year the winner will also be given the opportunity to travel to Japan in the autumn to share their project as part of Watershed and British Council’s new Playable City Tokyo programme. All seven shortlisted project proposals are available online for the public to ask questions of the creators and share their comments with the award judging panel, which this year includes: Tom Uglow, director of Google Creative Labs, Sydney; Jason Bruges, artist and designer; Miguel Sicart, Copenhagen-based play researcher and author; and Claire Doherty, director of Situations, Bristol. UK-based Kevin Walker and Yuri Suzuki’s shortlisted project Supernatural proposes to ‘re-wild’ and ‘re-wire’ the city, by creating ‘magical’ musical instruments from the natural urban infrastructure (plants, soil, wood, water) which produce beautiful mystical music when touched. Another music-based proposal is by US collective The Urban Conga. Why Sit When You Can Play uses LED and sensor technology to transform public benches into a platform for people to come together to play and learn music. By night, each note will also trigger street lights and surrounding buildings to light up the city. 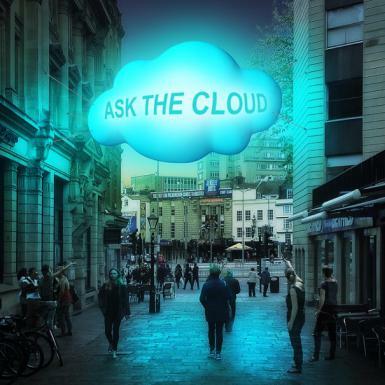 UK artist Tine Bech’s proposal, Whispering Clouds, would see two massive clouds hang over Bristol – one watching and listening for messages from the city, the other whispering the secrets and messages it has collected. A playful physical manifestation of the digital cloud, the project will explore our culture of sharing and probe the concepts of cloud computing and privacy. Also shortlisted are projects by Happy City Lab (Switzerland); LAX laboratory for architectural experiments (Poland); Strange Thoughts Ltd (UK); and Unsworn Industries (Sweden). The winner will be announced on 9 June 2015 with the successful artwork unveiled in Bristol in September.